Christmas is upon us and once again we will celebrate the birth of our Lord Jesus Christ, who through His birth brings with him love,hope,forgiveness,salvation,and everlasting life. There are some who think I am what is commonly called a "bible thumper" but I can assure you I am far from that but I am one who is eternally grateful to God our Father and the Lord Jesus. To our Heavenly Father, Will you sit for a moment or two and ponder the gift He has blessed us with? Let me help you a little bit to make it easier for you to see. He gave His ONLY son to the world. So that WE, you and I may be forgiven for our sins and enter into everlasting life with Him. Are you able to even grasp that? I can't. What person do you know on earth who would EVER give up their ONLY child to be crucified for the good and love of others? You have to remember, in the beginning the Jews were God's chosen people (still are) and the gentiles which would be you and I were not considered as His chosen ones and the pagans fared worse than us. It was only because of the Fathers love for us that He GAVE us HIS son so that we would become part of his chosen children through the Blood of Christ..Our Father sent His only son to earth knowing that His son would have to suffer in every way a person could suffer so that you and I would find forgiveness from his justice. How awesome is that? My human mind can not even grasp a 10th of that kind of unselfish, unending, unconditional love but, that is Our Father. Yours and Mine. He loves us that much. To Our Lord Jesus, I can not thank him enough each day for giving himself for us. He accepted the Fathers Will. 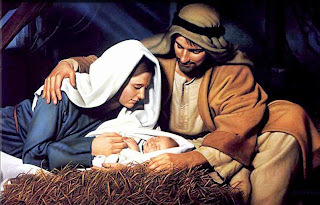 He chose to say Yes to the Father and he came to us in the form of an innocent child. Born of poor parents, born into a small cave (manger) with nothing. He suffered, what to us is unimaginable FOR us..He didn't have to, I'm sure the Father would have given Jesus the choice to come down to earth and suffer for sinners or stay in Heaven with Him. What would you have chosen? If I am honest with myself I can't honestly say I would have chosen as Jesus did. We would all like to think we would have but, would we? So, each day I thank the Lord for his sacrifice, I thank our Father for the gift of his Son. I thank him for my blessings both good and bad because I know He loves me. Had He not, Jesus never would have been born into this world. I thank the Virgin Mary who said Yes to God. She could have said no.. Can you imagine how frightened she must have been? First to even see an angel of the Lord, then to have it talk to her and tell her she has been chosen to be the mother of the Savior of the world? How frightened she must have been! But, she said YES! She said Gods will be done.. What would I have said? On top of that she was engaged to marry and at that time ANY woman having been found to have been unfaithful in any way to their intended especially, if found pregnant was grounds for death. You would be taken outside the walls of Israel (because to kill someone inside the walls was considered unholy and a desecration to Israel) Mary, for what would have been perceived as adultery would have been stoned to death! Mary also had to tell Joseph she was with Child and that she was impregnated by the Holy Spirit. Can you imagine what Joseph must have thought when he heard these words come out of her mouth?!??! As we all know from Scripture he didn't believe her at first. He probably thought she flipped her lid! But, once again God our Father sent an angel to assure Joseph that Mary was telling the truth. So we must also thank Saint Joseph, for he was chosen by God also and his reply was "Everything will be done just as God has willed it"..Joseph became in essence Jesus' step father. His earthly father. He helped to raise him, protect him and provide for him. All that God asked of him, Saint Joseph did as did the Blessed Mother Mary. My wish for all of you is , on this Christmas, be thankful, be grateful. Remember all the many many blessings given to us by our Father and our Lord Jesus. Even when life is hard our Lord never abandons us. When things happen that we just can not understand, our Lord is always with us. When terrible things happen and we don't know how God could let it happen, know Our Lord is with us. He never abandons us. It is we who abandon Him. When our faith is tested we usually run away from God, blaming him but next time, try running TO the Lord because He WILL be there with open arms. He will strengthen you. Celebrate the birth of our Lord this year who came to us in the form of a tiny infant to bring us His unending Love and Mercy for without Him, we are nothing. Happy Birthday Jesus.. Wonderful Christmas message! Merry Christmas to you you and Lou. And thank you for being a part of my Christmas and life. God bless you both, specially on the holy of nights, Christmas Eve.